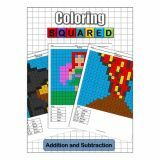 A surefire hit with students, Coloring Squared: Addition and Subtraction is here to supplement math fact programs with compelling pixel art coloring puzzles that combine the fun of coloring with rigorous math fact practice. Aligned to the Common Core Math Standards, each book contains 40 puzzles with more than 300 addition or subtraction problems each. Coloring Squared: Addition and Subtraction is perfect for homework, bell work, and review. 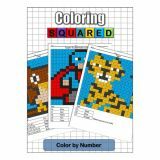 A surefire hit with students, Coloring Squared: Color by Number is here to supplement number recognition and number sense with compelling pixel art coloring puzzles that combine the fun of coloring with rigorous number sense practice. Aligned to the Common Core Math Standards, each book contains 40 puzzles with more than 300 number recognition problems each. Coloring Squared: Color by Number is perfect for homework, bell work, and review. 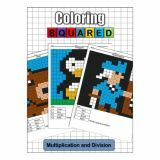 A surefire hit with students, Coloring Squared: Multiplication and Division is here to supplement math fact programs with compelling pixel art coloring puzzles that combine the fun of coloring with rigorous math fact practice. Aligned to the Common Core Math Standards, each book contains 40 puzzles with more than 300 multiplication or division problems each. Coloring Squared: Multiplication and Division is perfect for homework, bell work, and review.